Are you a parent? If you are already, or if you’re expecting (congrats!! ), chances are the idea has run through your mind to become a stay-at-home parent, living on one income. Yay! This can and does work for countless families, and it can work for yours as well. Drooling over being a stay-at-home-parent doesn’t have to get messy. Living on one income is possible, and should you desire to make this a reality, you’ll want to start as soon as possible toward that goal. First, you’ll want to sit down with your spouse and talk finances. Yuck. I know, but you need to be on the same page. Budgets don’t make themselves, honey. Create two budgets – one using the numbers you are both currently bringing in, and one using the numbers of only the one income of the person that is going to remain in the workforce. You’ll need to figure out if this goal of staying home is attainable, and figure out what you can do to make it even more so. Keep in mind that with one of you staying home, you will eliminate the need for childcare – which, for many parents rivals the monthly mortgage payment. Ouch! You would also eliminate gas and transportation to and from work, as well as new dress clothing for said job and any lunches or coffee you grab along the way etc. It costs more to actually get to work than you may think! Will you be able to cut down on dinner expenses since you’ll be available to cook at home? How about going a few weeks longer in between hair cuts? We’ve got some killer recipes for you to try. Will you have time to make more homemade items such as your laundry detergent, dishwasher detergent and baby wipes and glass cleaner? This can save significantly (and we’ll be sharing more and more homemade recipes as we perfect them!) as many of these homemade items use the same or a combination of similar ingredients. Once you remove the spending that you are currently making room for in your two-income budget, what does it look like? Would you be able to swing it on one income? There are even more things you can do to tweak your budget, without taking all of the fun out of staying home. Before going down to one income, ask yourself if it would it be possible for you to lower your car payment, or pay off that loan entirely, freeing up more wiggle room. Could you eliminate the cable bill? Pay off as much debt as possible before going down to one income to make this goal more attainable. Yes, this means three times. After removing as much as possible from your new one-income budget, go back through again and review each line item. Do we really need that higher cell phone plan? Could we do with just one car for a while? This would not only eliminate a second car payment, but it would reduce your insurance premiums and your gas. If you can’t make do with just one car, don’t feel bad! What about selling your more expensive car and getting a reliable used car with a much lower payment or no payment at all? Could you do better by refinancing your home for a lower interest rate, or downsizing? If you’re really wanting to have one parent stay home, this might have to be included in your plan of attack. You’re not only going for a smaller monthly payment, you’re looking at lowered property taxes, utility expense and much more associated with owning a home. Sell everything and anything you can either in a virtual yardsale group (there are oodles of them on Facebook) or on Craigslist or eBay – or have a killer garage sale. Not using it? Sell it! Start now to build up a cushion or use that supplemental income to pay off those credit cards or car loans. Are you crafty? I crochet (see a bunch of my free patterns here!) and I sell items on the side from time to time – as requested. Your time is valuable and you can make enough to pay a monthly bill or two if you’re diligent. Simply put: Paul and I rarely spend money on entertainment. We rent most of our movies from the library at no cost, and we cash in on Redbox codes when they are available. I read a lot and one of my favorite pastimes is – you guessed it – crochet and audiobooks. Which coincidentally, both relaxes me and earn me a little side hustle! I rent audio books from the library and I also get unlimited free audio books. Important! Try not to tap into your emergency fund. That is for an emergency – such as the tires needing replaced, or Johnny broke his leg etc. Also, you’ll want to make sure that you are covered with medical and health insurance before putting in your notice. Check into your options thoroughly before making any rash decisions. What other things could you eliminate or do to make staying home work for your family? 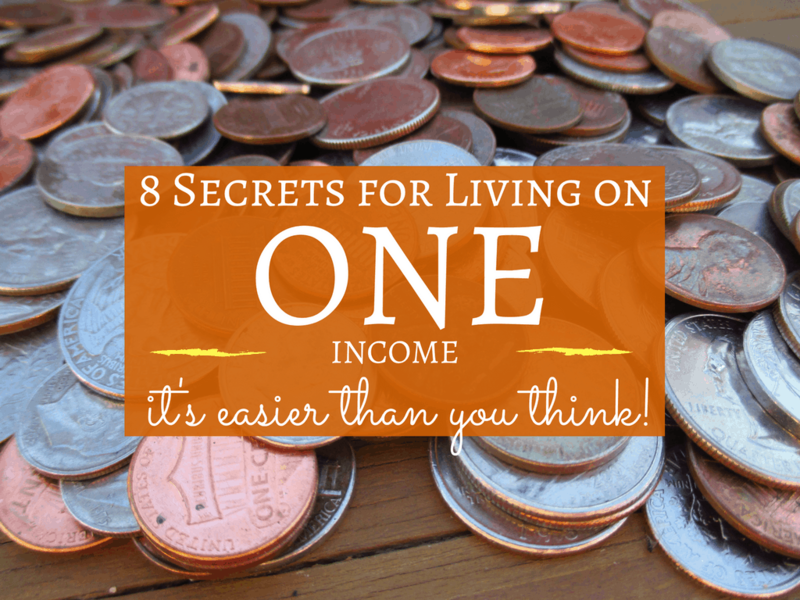 I would add to actually live on the one income before you make the leap. Put that one income in savings for 3 to 9 months subtracting out only child care you actually are paying now and watch your bank account to see what happens. Then you see before you quit and you build a safety net for when the water heater and washing machine go out in the same month! 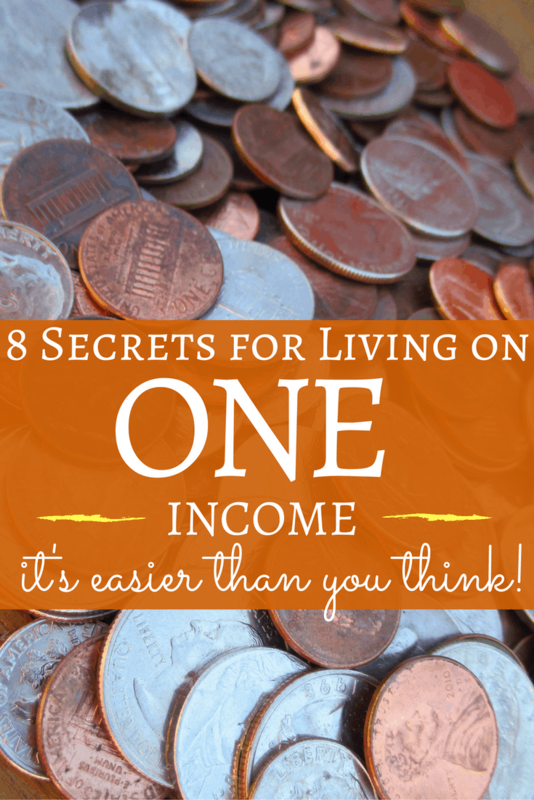 We have been on one income for a while now. We also homeschool our children, which means double the food bill! Coupons, sales and waiting for a good deal on "extras" (that is the hardest part) are a must! Homemade presents for gifts (my husband and I make something KU for my father every year for Christmas and he loves it!). I made "spa day* baskets for the women in our families (homemade bath salts, bombs, and soaps), they always seem to go over better than just a gift card. We also keep a gift closet, which is mainly really cute toys or cool board games that i found on clearance, for the kids to give at bday parties. (2 months ago, Dillons had minecraft plushes on clearance for $5 , normally $20). It doesn't seem like much but it really does help and make a difference. I also bake, sometimes people will pay me to make cinnamon rolls, 10-12 pans at a time (from scratch they avg at $1 per batch cost to make, including foil pans) . So if you have some goodies you are willing to bake/make, you can take them to local bakery's (split the profit between you and them) or arts and crafts fairs and sell them. Just little things, they really just require your time, which can seem like a lot, but it is totally worth it. Just an fyi, for those out there like us, we love computer games! Humble bundle has weekly and monthly deals on computer games and you set the price! A percentage of that money goes to a charity of your choosing. We love it! Also Steampowered.com always has 2 major sales of the year, spring and winter, We buy must of our games during this time, between 75%-90% off! So it is possible to still have your games and be frugal as well, just takes time =). I love it! Thank you for sharing! !